Imagine, in the frigid depths of space, a pair of immense black holes crashing together so violently that they shake the fabric of space and time. A black hole forms when a massive star burns out and collapses to an immeasurably dense point. Its gravitational pull is so strong that everything that comes within a certain distance, even light, falls in and cannot escape. That’s why black holes are invisible and unknowable to the outside world. Astrophysicists recently tuned in to the tremors of faraway black hole collisions using the Laser Interferometer Gravitational-Wave Observatory (LIGO). 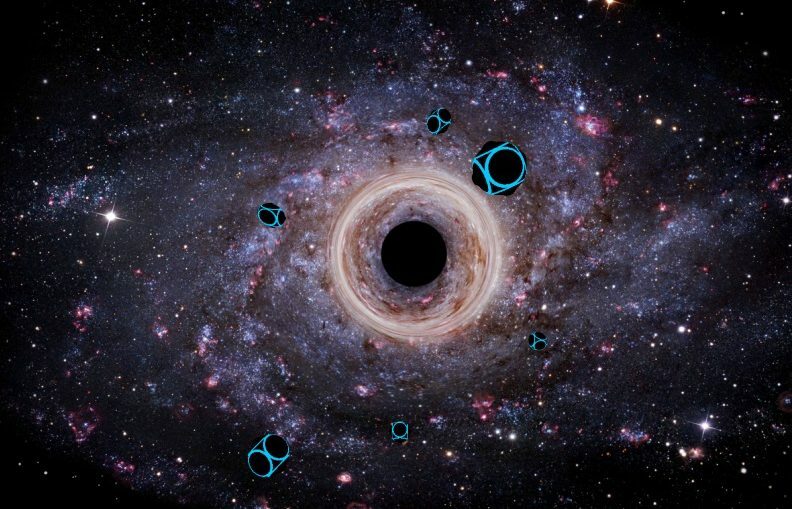 They’ve learned that black holes are bigger and more numerous in the universe than previously known. While LIGO can sense the whereabouts of these blank beasts when two of them spiral together and merge, we discover nothing about their inner lives. How we wish we could. The centers of black holes are the breaking points of Albert Einstein’s reigning theory of gravity. Whereas Einstein equated gravity with curves in the space-time fabric, space-time ceases to curve smoothly inside black holes, or even to make sense. Knowing what happens inside black holes would reveal the unknown, quantum nature of gravity. To experience these mysterious objects up close, Quanta Magazine partnered with Bandwidth Productions to depict a future generation of scientists that sends a fleet of robotic probes to a pair of black holes that are about to merge. After the merger, the probes approach and enter the resulting black hole — visualized with the help of physicists Anthony Aguirre and Duncan Brown and referencing the technically accurate black hole simulations of physicist Andrew Hamilton. You’ll have to download the “Black Hole VR” app to your phone from either the iOS App Store or the Google Play Store to find out what happens next. Open the app, insert your phone into a Google Cardboard viewer or another VR headset, and press play to take the plunge.